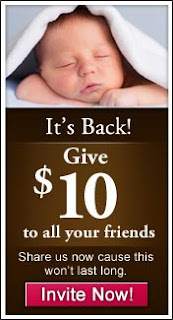 Check it out, head over to bTrendie now and sign up, you will immediately receive a $10 credit in your account. Then, invite your friends to join, they will also receive the credit, and when they purchase anything, you will receive another $10 credit! Click HERE to see the adorable headband I was able to get for my soon to be born granddaughter . Hurry before this ends, the credit doesn't expire, you can get it now, and use it at another time, because the items available are always changing.... go sign up HERE now!